SuperSpeed USB 3.0 supports transfer rates of up to 5Gbps – The actual transmission speed is limited by the setting of the device connected. Notice: Windows XP and Vista Users Please Note: Due to OS limitations, the real transfer speed after installation of the respective drivers will be located between the level of USB 2.0 and 3.0. Due to frequently updated drivers, please download the latest version on our official website Inateck to enhance your using experience. 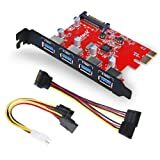 1.To ensure the PCI Express Card works properly, please first connect the PCI Express Card to your PC’s power supply. 2.Installation: Please go to the Inateck Website to view the PCI-E Card Installation Video. 1) If your PC’s power supply unit only has free 4pin Molex plugs left, please use the enclosed 4pin Molex to SATA converter to power the card; Please make sure the power cable strand colours match each other when connecting to the power augmentation, as to avoid faulty currents. 2) If there is no free 15pin SATA plug available in your PC, please use the enclosed 15pin to 2x 15pin SATA Y-cable. 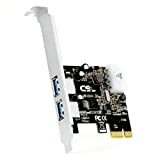 – PCI Express Expansion Card with 4 USB 3.0 Ports: With quick and easy installation, this PCI Express card expands your PC by four high-speed USB3.0 interfaces,Â offers a simple solution for connecting to USB 3.0 devices from your standard desktop PC. –Support UASP: 70% Faster than traditional USB 3.0, with UASP Transfer Protocol; The UASP Transfer Protocol only can accelerate read and write speed of SSD hard disk. Windows 8 – No additional drivers are needed for Win8, it has built-in support for the FL1100 chipset.